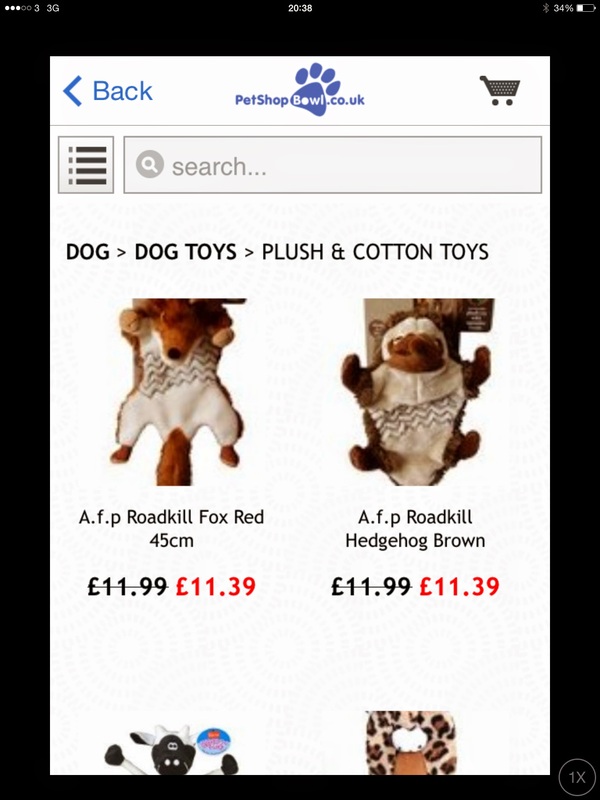 So, like any normal pet shop, they offer over 10,000 products from the top brand names, and strive to keep prices low, and from our wander around the website, they seem to so this pretty well! The ship to the UK and have just introduced shipping to mainland Europe. But on top of this, they offer something called Bottomless Bowl at checkout. That means you can select an auto-order frequency, anything from 2-12 weeks, and that's it! No more worrying about running out of food! Although Hooman forgot to order my food once, and I got to eat chicken for a couple of days, so I wasn't complaining heehee. On top of that, UK delivery is free for orders over £19.99 (by tracked courier which is really helpful). And what if the price of the food goes up, I hear you ask? Not a problem - they will keep you informed of any price changes. What a fantastic idea! The idea came to the founder after his mother, who suffers with arthritis, would struggle carrying huge bags of dog food home from the shops, plus last minute dashes out to stock up on cat food. 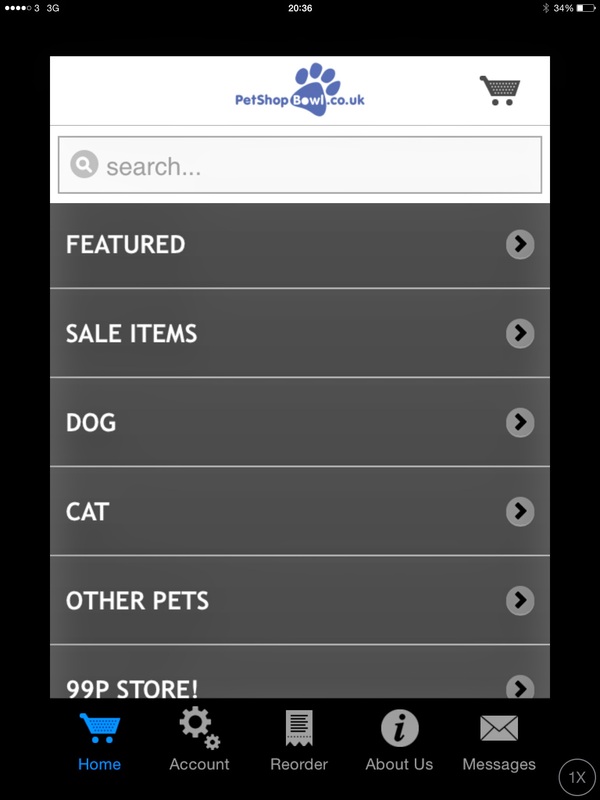 Lastly, before I get onto the important bit of what they sent me, they even have an app, so you can order everything directly from your phone / mobile device - very handy if you are a techie geek like my Hooman! Now, most dog owners will know what a Kong is. And if you don't, where have you been! The Kong is THE dog toy that probably the majority of dog owner will own. Strangely enough I didn't have one! I had a little puppy one which I was never that interested in, so Hooman never thought to try me with an adult one. 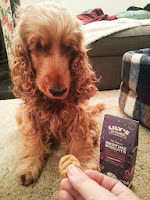 So she stuffed it with a bit of Salmon Mousse from Fish4Dogs (another review, another day!) and I was hooked. So I have joined the legions of Kong fans! 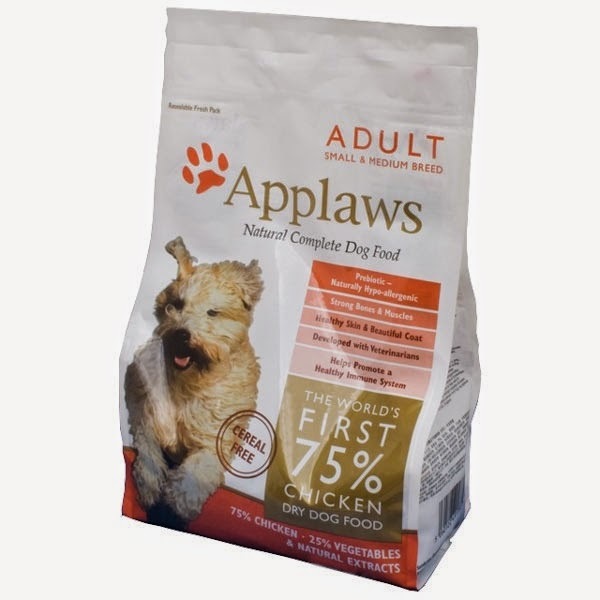 Applaws is a superior dry food, made with 75% meat and no cereals or grains. 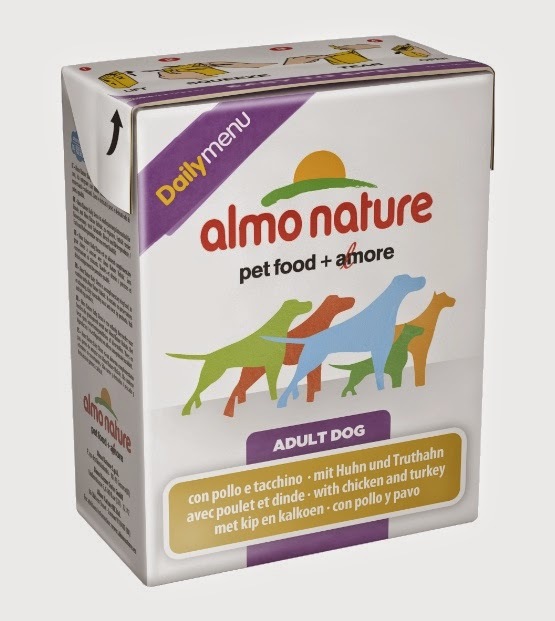 Hooman is a huge advocate for these types of complete food and this has been on her list of considered foods before, as it rates highly on Which Dog Food. I had a little taster (remember It is never good to change food over suddenly) and really enjoyed it. They have various varieties, including Lite, Senior, Large Breed, Puppy and a wide variety of cat food too, for the felines among you. 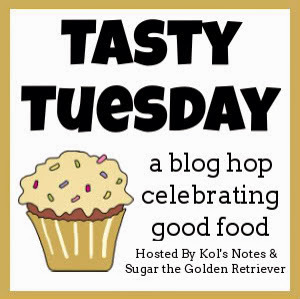 This was a new one for us - I eat another wet food mixed in with my normal kibble, so we tried this one instead. And I did gobble it up! On reading about this food, again, it is made with quality simple ingredients in mind, using 50% premium meat and fresh vegetables. It comes in a tetrapak, so it easy to store as well (plus when opened, can be kept tucked away in the door of the fridge, rather than taking up lots of shelf room!). We know and love these little biscuits! Hooman always gives me a biccie at bedtime, and these are our favourites. These little biscuits are traditionally baked, and include pro biotic yogurt, honey, passion and chamomile flowers in the ingredients, and smell so lovely, Hooman has almost been tempted! We think PetShopBowl is definitely worth a look both to see if you can save money on your brand of food, and to sign up to the Bottomless Bowl reordering service! Hooman would be on it if they sold my food, but unfortunately that is still only sold by a few retailers (pssst, PetShopBowl - Eden Holistic!). And not forgetting they sell for dogs AND cats, plus a huge variety of toys, bedding, accessories and grooming products. 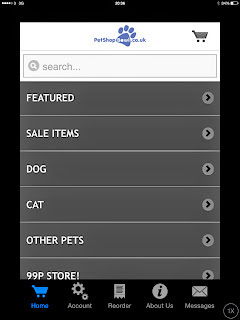 Clicky here to visit PetShopBowl - if you are on a mobile device, a pop up will ask you if you want to download the app. 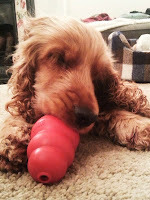 And it was a pawsome goody box - I am a Kong convert! That does look like a great box - these have become very popular in the USA and they offer such a wide variety of goodies that we may not get locally where we live. Looks like a great box of goodies there Lottie. Enjoy. Have a marvellous Monday. 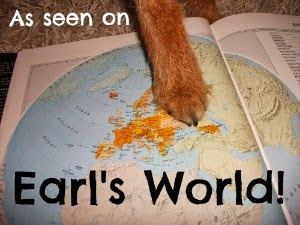 We haven't heard of this particular site. It sure does look like you have some great stuff!! They are a relatively young company but worth a browse!